Participant in Blogging 201, an online class for WordPress bloggers interested in growing their readership and creating an interesting site in terms of appearance and function. I’m taking the course because my new cooking blog is a departure from the professional blogs I have been writing. Some participants are creating blog posts related to assignments; some only participate in the Commons space created just for participants. The Warhol MOOC provides an introduction to the life and work of Andy Warhol, one of the world’s most famous artists. Over five weeks, the course will: explore why Warhol has international standing both within and beyond the art establishment; examine how artistic worth and value is constructed and attributed; interrogate some of Warhol’s main thematic concerns and major creative innovations; position Warhol in relation to major artistic movements of the 20th century (Dada, minimalism, Pop Art, structuralism, etc). 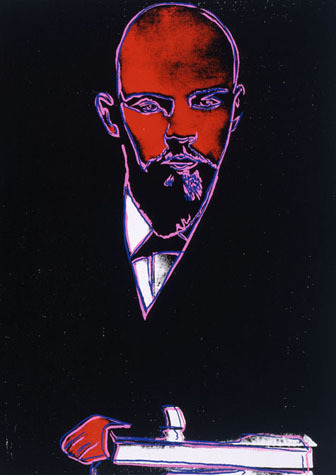 Warhol’s work is often discussed in relation to the subjects of appropriation and repetition. For this assessment, you must create your own piece of Warhol-like work. This can be done in an analogue or digital format. Warhol always worked in analogue, of course, and you may want to do the same in order to get a feel for the materials that he used. You should select an image that you find in a newspaper, magazine, or online. You could choose a picture of a celebrity (like Warhol’s images of Marilyn Monroe or Elvis Presley), a product (like Warhol’s Coca-Cola bottles, Campbell’s soup cans, or Brillo boxes), or a picture of a tragedy (like in Warhol’s Death and Disaster series). Crop this image as you think appropriate. Multiply it as many times as you like – or if you think it works best in isolation, as a single image, you can do so. Play with colour: your completed image could be all one tone, or use several colours. You need to post two things: the completed image, and a short piece of text about the picture. Your completed image can be posted in the box on this page, or you may host it on an external site. If you host it externally, please provide a link so that others can see the image. You should also write three sentences about your finished work. In sentence 1, you should explain how you chose the image that you appropriated for your work. In sentence 2, you should explain why you chose to use analogue or digital methods, and the challenges that these presented to you. In sentence 3, you should justify the aesthetic decisions that you made (cropping, repetition, colour use, etc). Do not write more than 300 words. 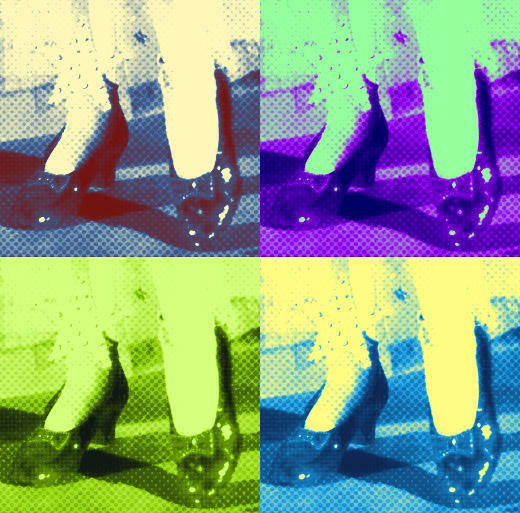 I tried to think of an item that was already a cultural icon and that had some connection to a celebrity and, obviously, chose the ruby slippers from the film version of The Wizard of Oz, which are identified with Judy Garland, and by extension with Liza Minelli, both of whom Warhol had painted. Having no art experience (I have degrees in English), I chose one of the suggested online filters, because I was looking to play with the iconic color of the shoes, specifically to take away the ruby color and have viewers think about the importance of that color to this specific icon. The Anymaking site automatically created the repetition in the image, which is what I was looking for in order to show the shoes in multiple colors that question the importance of the original red in our imaginations. I tried a few clicks of the color randomizer before I could find a combination that did not include red. The filters also extend the shoes into the background, so that where in the original image the shoes stand out, in these images, the shoes are no more significant than their surroundings. That effect would have been the same with a red filter, as well. Choose one piece of work by Andy Warhol. This might be a drawing, a painting, a sculpture, a photograph, a book, or a film. Describe, discuss and evaluate this piece of work. What does the work depict? What materials is it made of? Do you know how it was produced? Is the work part of a series? Can it be related to other works by Warhol? How does the work relate to works by other artists (other Pop Artists, other filmmakers, other painters, etc)? Have any critics and theorists discussed this work? What do they have to say, and do you agree with them? Is this work related to one of the five themes that we have explored in this course? If so, how? Your submission should be no more than 750 words, and no shorter than 650 words.